MEYER -Neueste Karte von Nord Carolina mit seinen. . . 1845. N° 78. MEYER, J. - Neueste Karte von Nord Carolina mit seinen. . . 1845. N° 78. Neueste Karte von Nord Carolina mit seinen. . . 1845. N° 78. - MEYER, J. Title : Neueste Karte von Nord Carolina mit seinen. . . 1845. N° 78.. 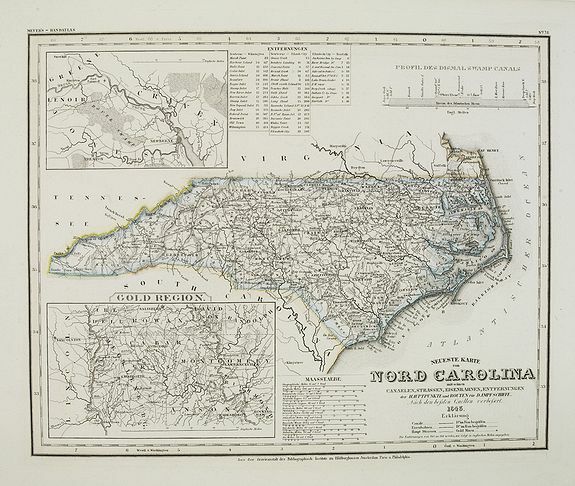 Description :Detailed map of North Carolina with numerous physical and political features including mines, settlements, trails/roads, forts and Indian areas.